Why is bathing crucial to those with ichthyosis? Ichthyosis is a genetic disorder in which the body's ability to produce the outermost layer of skin, the stratum corneum, is defective. The problem may be visualized as a traffic jam of cells on the skin's surface. This may result from one or both of two problems. Either the body manufactures the stratum corneum too rapidly (up to 300% of normal), or the stratum corneum fails to shed properly from the surface of the skin. Because the skin is constantly renewing itself, either of these two interruptions in the balance between the making of the skin and its shedding results in the symptoms of ichthyosis: thickened or thin, scaly skin. Symptoms can vary significantly from person to person. Some people are affected only locally (for example, only on the hands and feet), while others exhibit total, or near-total, body involvement. The skin may be reddish, extremely flaky, or the body may be covered with thicker, plate­ like scales. Many people have significant scalp involvement, which inhibits hair growth. Some may have hearing problems caused by accumulations of exfoliated skin that binds with natural waxes and blocks (or occludes) the ear canal. Some may have moderate to severe itching. Still others have moderate to severe body odor, which results from unavoidable accumulations of harmless bacteria beneath and between the scales. Most people are at an increased risk for skin infection due to breakdowns in the skin's natural barrier function. Severely affected patients may suffer from fine and/or gross motor impairment due to tautness of skin on the hands, and from tautness and cracking of skin on the soles of the feet. Disruption of the skin's barrier function also leads to excessive water loss. This is why the skin becomes so dry. In the extreme, this may lead to dehydration. Because ichthyosis is a life-long condition, and because there is no cure, the goal of treatment is to alleviate symptoms and relieve discomfort. The goal in treating the primary symptoms of ichthyosis is moisturizing affected areas of the skin while promoting exfoliation (normal shedding) of the skin's outermost layer. Bathing is important to the shedding process, as it not only cleanses our skin of dirt and other external debris, it completes the natural process of desquamation, sweeping away spent and finished epidermal cells. What exactly is desquamation? The epidermis is a self-renewing system. Old cells (squames) are shed from the skin surface as new cells (keratinocytes) are produced, in the underlying epidermis, and pushed outward into the stratum corneum (the outer most layer of the epidermis) to become corneocytes. This process is known as desquamation. In the recent past, it was thought that the process of desquamation initiated the progressive breakdown (proteolysis) of protein-forming structures called corneodesmosomes. These protein-forming structures link adjacent corneocytes to one another. We now know this prior model does not fully account for desquamation, because the cells detach well above the sites where these junctions are degraded. In other words, proteolysis of corneodesmosomes may be necessary for desquamation, but it is not sufficient to complete the entire shedding process. What does this mean for the ichthyosis community? There’s no question – for those affected by ichthyosis, frequent bathing is extremely important, as it is not only the best way, but the most natural way to remove dry scales and skin, and most importantly, more frequent bathing can ease the distress of ichthyosis, making day to day life much more comfortable. There’s no question, for those affected by ichthyosis, frequent bathing is very important, as it is not only the best way, but the most natural way, to remove dry scales and skin – and, most importantly, more frequent bathing can ease the distress of ichthyosis, making day-to-day life much more comfortable. The following physician-recommended recipes assume an average tub size of 90 gallons, filled to the brim. If you normally fill the tub one-third full before you get in, these are the amounts to use. Soak for a minimum of 30 minutes; one hour is better. Each of these baths should be followed by generous application of an emollient. Salt Bath for Removing Scale: Aim for as much as a 3% solution. This is just less than the amount of sodium chloride in the ocean. This equals 1/4 pound per gallon of water - or 5 lbs in 20 gallons or 7.5 pounds in 30 gallons. Less salt may work for some, if you soak for at least an hour. This is safe to use every day. Baking Soda Bath: Aim for a pH of 7.9. The amount of baking soda to add may vary with the quality (pH) of your tap water. In most cases, adding one-third cup to a tub one-third full with water will raise the pH to 7.9. You can test the water after the baking soda is dissolved with pH indicator paper. You must soak for 45 minutes to one hour before starting to gently slough scale with a washcloth, loofah or other gentle mechanical desquamator. Baking soda baths can be used up to several times a week. 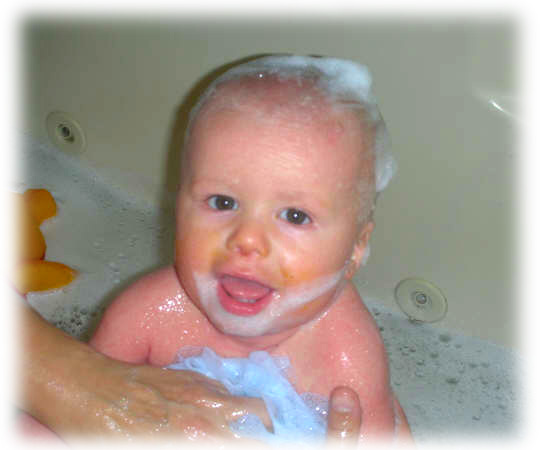 Antimicrobial Bleach Bath: Measure the amount of water usually put in the tub. Add 10ml (2 teaspoons) of household bleach per gallon - i.e., about 1 cup in a half-full tub (40-50 gallons). Soak for a minimum of 15 minutes - longer if you want to remove more scale. Bleach baths once or twice a week should be adequate to reduce odor and the frequency of infections; daily for one week may be necessary for someone currently infected. Remember, undiluted household bleach is quite irritating. Be careful how you handle it. Post Bath Emollient: It is important to use an emollient after bathing. If you have taken an alkaline bath (by using baking soda or bleach) it is a good idea to restore the natural acid pH of the outer layer of skin by using an emollient with a slightly acid pH, such as Lac-Hydrin or AmLactin. Why do dermatologists recommend bleach baths to many of their patients with ichthyosis? Decrease Odor – Bleach baths reduce the amount of odoriferous colonization by potentially pathogenic microbes on the skin surface. Decrease Infection – Bleach baths can decrease the risk of infection. Separation of Cells - First, some of these enzymes degrade the connections that hold the cells of the stratum corneum together, causing these cells to separate from each other, and eventually to be shed from the skin surface. Obviously, for someone who has too thick a stratum corneum, bleach baths could prove to be an advantage. It should be noted, however, that there are no experimental or clinical data proving that bleach promotes desquamation. Inflammation - Second, some of the enzymes that are more active at higher pH can provoke inflammation, because they activate and release pro-inflammatory cytokines, proteins that normally are stored inside stratum corneum cells and shed harmlessly. Currently, there are no studies that address whether the slightly alkaline pH of bleach baths increases inflammation in those who have inflamed skin. Somewhat surprisingly, there is one study showing that dilute bleach has the ability to reduce inflammation in an animal model of inflamed (not ichthyotic) skin. So in sum, we still have questions about the impact that bleach baths have on inflammation in our patients. Most of us would agree that, taken together, the benefits of bleach baths in reducing microbial overgrowth, odor and infections far outweigh the uncertainties arising from its slightly alkaline pH. Yet none of us would see any advantage to prolonged exposure to the abnormally high pH of dilute bleach baths for patients with ichthyosis. Instead, it would seem prudent to follow one’s bleach bath with a generous application of a slightly acidic emollient, such as amlactin or lachydrin, to help restore the skin’s natural acid mantle. Traveling with children can certainly present its own unique set of challenges. Add in the fact that most FIRST families are also coping with children who are affected with a rare skin condition and the challenges become even trickier – particularly when it comes to bathing. Bring along a blow up baby tub. It’s easy to pack and you don’t need to use the hotel tub. Bring a big Rubbermaid container to pack things, and then use it as a tub as well when you are at your destination. Magic Eraser cleaning sponges and bleach wipes could also do the trick for a bath. Bring antibacterial wipes with you when you travel. You can use them for cleaning stations and bathtubs. Consider switching to showers when traveling and resign yourself to the fact that kids may look a little “rough around the edges” without their same bath routines. Members shared these tips for coping with their ichthyosis or related skin types on FIRST’s Facebook Group pages. FIRST does not endorse or recommend any treatment regimens, diets, medications, or products. Exfoliation is the act of removing the outer scales from the skin. For those individuals with hyperkeratotic ichthyosis (i.e. thickened skin) exfoliation can make you more comfortable doing day to day activities. And those with CIE, harlequin, or epidermolytic ichthyosis will find exfoliation most beneficial. However, exfoliation, while removing the scale, often brings out the underlying erythema or redness. So you may trade the scale for the redness. This is not an issue if the scale is very bothersome, but it is important to keep in mind if you do not want to be red. In other cases, such as Netherton syndrome, the skin barrier is impaired, and the skin should not be further exfoliated. Exfoliation will only lead to increased sensitivity and irritation in this case. After soaking in a tub for an hour or longer, use a wash cloth or loofah brush to gently remove the outer layer. After bathing, try using a cream or lotion with ammonium lactate, salicylic acid, or urea to help soften and exfoliate the outer layer. For those with thick scale under their eyes, topical tazarotene can loosen the scales and allow their eyelids to close more fully. Use baking soda and make a paste which would be considered a mild abrasive to aid in loosening the dead skin. Add Vaseline Bath Beads or apple cider vinegar to the bath water to help in softening up the skin before exfoliating. Let a loofah sponge soak in water for a few days before using, they will eventually soften up. When exfoliating areas such as knees, elbows and feet, if it starts to hurt, stop, and continue the next day. The salty ocean does wonders for the skin, and works as a natural exfoliant. Hydrotherapy, whereby the water and air is circulated throughout the tub, may also be a beneficial way to soften and exfoliate skin.